Ned Martin was one of the most beloved of the Boston Red Sox play-by-play announcers. He helped to call the games on radio, and then on TV, from 1961 to 1992; in 2000, he was inducted into the Red Sox Hall of Fame. Ned Martin was one of the most beloved of the Boston Red Sox play-by-play announcers. He helped to call the games on radio, and then on TV, from 1961 to 1992; in 2000, he was inducted into the Red Sox Hall of Fame. But Martin did more than broadcast Red Sox games. He also called college football for Dartmouth, Harvard and Yale, and in the mid 1960s, he announced professional football for the then-Boston Patriots. Edwin “Ned” Martin was raised in Philadelphia and graduated from Duke University. A World War II veteran who served in the Marine Corps, his ﬁrst broadcasting job was calling minor league baseball in Charleston, WV in 1956. In 1960, he met Boston Red Sox announcer Curt Gowdy, who became impressed with his work when they called a portion of a Washington Senators/ Boston Red Sox game. Gowdy recommended that Martin be hired by the Red Sox, and in 1961, he was. Martin, with his trademark “Mercy,” was heard on WHDH Radio and TV in the 1960s, where in 1967, he called the ﬁnal out of the Red Sox pennant-winning “Impossible Dream” season; he was also at the mike during a number of other Red Sox milestones. 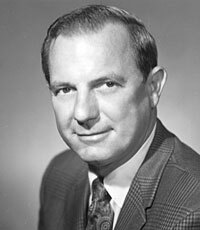 Martin was later on WMEX and WITS radio, and he was also a broadcaster for cable TV’s New England Sports Network (NESN). Known as one of baseball’s most literate broadcasters, who was comfortable quoting great literature (including Shakespeare), Ned Martin died in late July 2002, one day after he had appeared at a Fenway Park tribute to Ted Williams. Martin was 78.